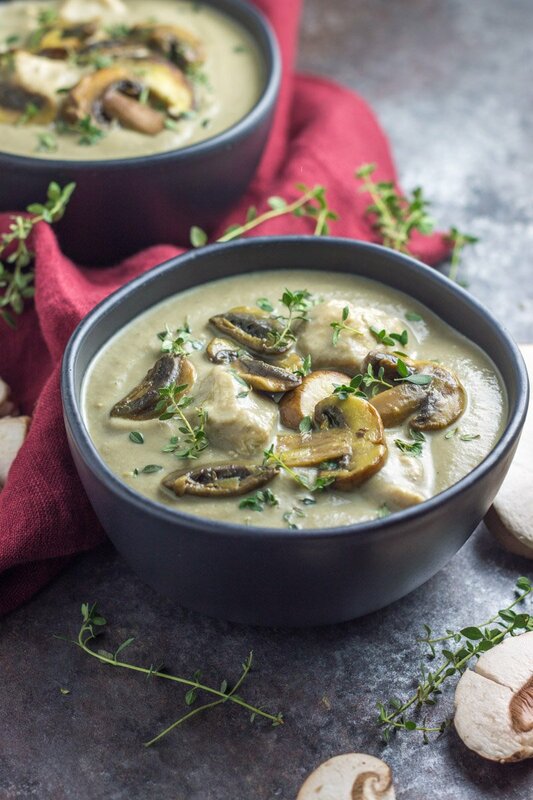 A hearty soup with a rich and creamy mushroom base paired with lean protein – this Whole30 creamy mushroom chicken soup is a mushroom lover’s dream! 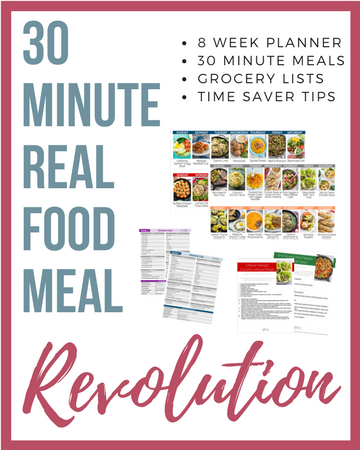 Simple steps and simple ingredients for the beginner or expert cook. I sometimes transport my mind to the days of newlywed life. Such fond memories of being a novice cook, taking our pooch for multiple walks a day when she was our sun and the universe revolved around her, and sleeping in on Saturday mornings before walking to our favorite breakfast spot with bedhead and no schedule the entire day. We used to camp out at our favorite sports bar on Sunday mornings for mimosas and football (because when you live on the West Coast, games start early – and it’s glorious). Most weekend nights were uneventful, spent doing laundry while watching a marathon of Redbox movies, then driving to get FroYo right before the shop closed for the night. We dreamed of someday having a home to flip like all the HGTV shows we watched. We dreamed about the someday European vacation we’d take. We dreamed about following our dreams and settling in to our careers. 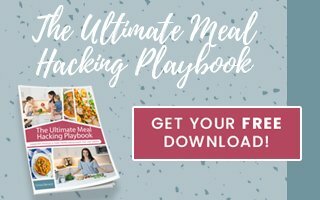 Our life seems drastically different now – wake up calls at 6am with little feet crawling in our bed, promising the dog we’d let her out to potty as soon as we finished getting breakfast ready for the little ones. Laundry piles are higher, football games are drowned out by laugher or crying, Chip and Joanna have become our couple crush – not because of their talents but because of their sweet, seemingly solid marriage. We DID flip a house, took a trip to Italy, and I followed my dreams starting Physical Kitchness and my hubby settled in to his career as an officer in the Marine Corps. Oh and we had two adorable boys. So all in all, I think we’ve done pretty well thus far. And! And and and….my novice cook status has stepped up a notch or two. My idea of soup seven years ago as a sweet newlywed was nuking some Campbell’s in the microwave. WOW, some things HAVE changed. 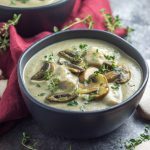 This Whole30 creamy mushroom chicken soup would have knocked my socks off as a newlywed, just as it does now. But what I’d tell my newly-last-named-self is that this recipe is just as easy as pouring canned soup in a bowl. And it’s waaaaaaaay better for you. Then I’d make it, remind my new husband how awesome his new wife is, and start my healthy eating cooking much earlier than I actually did. 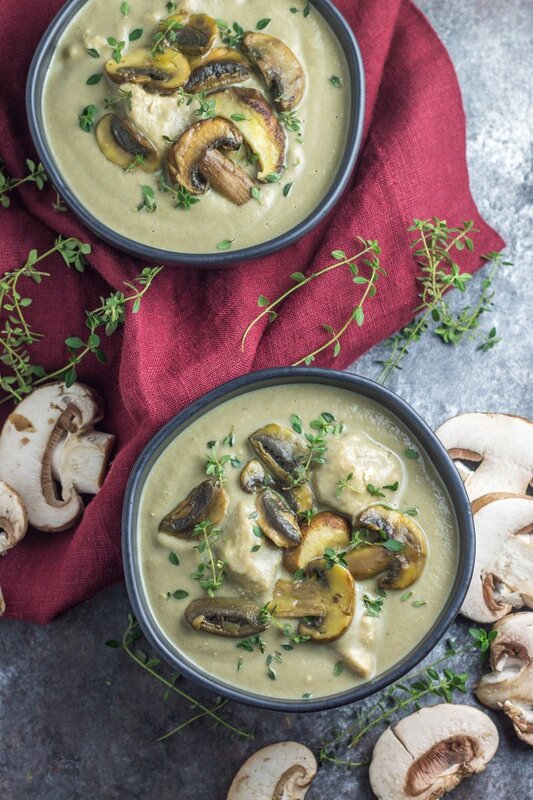 This hearty and healthy dairy free soup dinner has the richest, creamiest base that will make any mushroom lover SWOON. I added diced chicken, but you could certainly use shredded chicken or omit the protein completely. 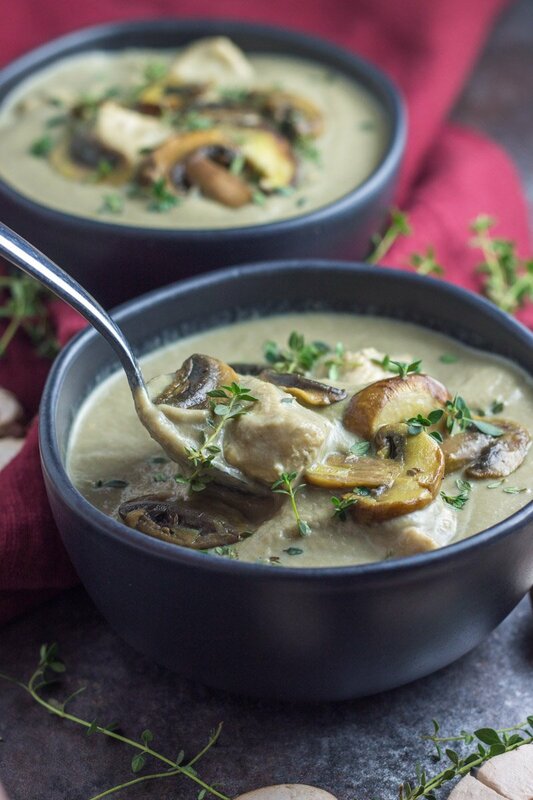 Simple steps like sautéing onions and mushrooms, then blending and adding a few ‘base’ components gives this soup a beautiful velvety texture for a rich and filling meal – it’s hard to believe it’s actually good-for-you. Love comfort style soups like this? 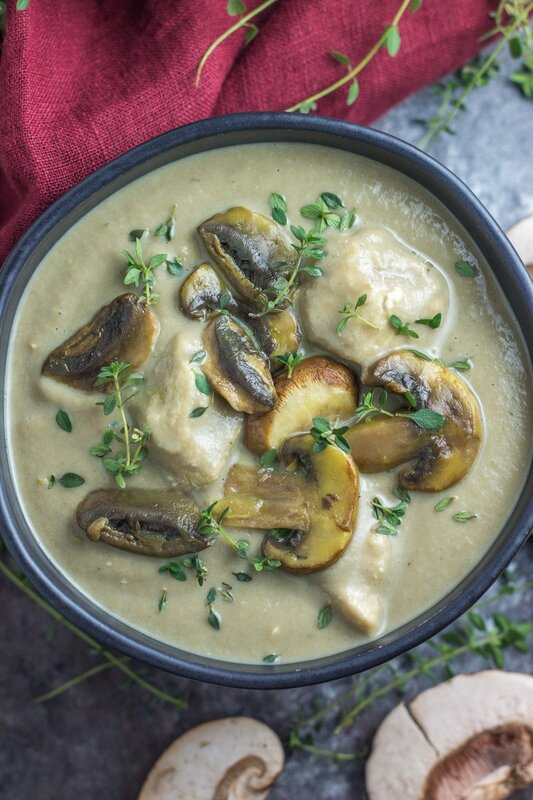 Then you have to try this white bean and potato salmon chowder, or this tomato basil bisque with Italian meatballs, or this parsnip leek butternut squash soup, or this skinny fiesta chicken soup, OR this pumpkin coconut curry soup with sweet potato noodles. Sorry! Coconut cream is the thick stuff at the top of a chilled can of full-fat coconut milk. That’s the good stuff you want to use!